While anarchist history has not been free of violence, anarchism has been largely a tradition of workplace and community organizing (Woodcock, 1962; Marshall, 1993; Kornegger, 1996). The writings of people such as de Cleyre, Godwin, Goldman, Goodman, Kropotkin, Reclus and Ward are moved overwhelmingly by sentiments of mutuality, conviviality, affinity and affection (though they never shied away from a fight). 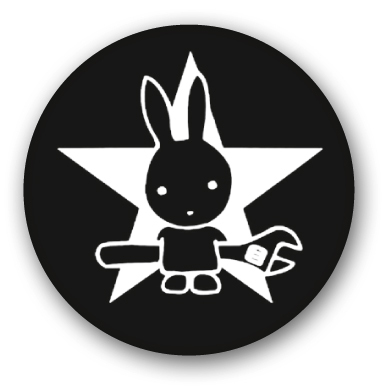 Most anarchist practical initiatives have been directed towards building new communities and institutions. If anything, the history of anarchism shows that it is anarchists themselves who have fallen victim to political violence. As Marshall (1993: ix) notes, anarchism “appears as a feeble youth pushed out of the way by the marching hordes of fascists and authoritarian communists” (not to mention the hordes of nationalists and populists). Anarchists are certainly not lacking when it comes to martyrs (The Haymarket Martyrs, Joe Hill, Frank Little, Gustav Landauer, Sacco and Vanzetti, the Kronstadt sailors and the Maknovists of Ukraine are only a few of the anarchist victims of State violence). While sociologists have paid little attention to such uncivil and unruly movements, criminologists have recently shown some interest in taking anarchism seriously as politics. Ferrell (1997) suggests that becoming attuned to anarchist practice and the anarchist critique of the State is especially relevant in the current context. In his view, close attention to anarchism should encourage criminologists to develop a criminology of resistance. This criminology of resistance would take seriously the criminalized activities undertaken by anarchists (and others), e.g. graffiti, squats, pirate radio, sabotage, “as means of investigating the variety of ways in which criminal or criminalized behaviours may incorporate repressed dimensions of human dignity and self-determination, and lived resistance to the authority of state law” (Ferrell, 1997: 151). These behaviours should no longer be dismissed as symptomatic of an “infantile disorder,”3 or “banditry,”4 but taken for what they are — political acts. This, of course, requires making a break with assumptions of privileged forms of resistance and received notions about activism. The tactic of organizing black blocs emerged from the autonomen movements in West Germany in the 1980s. Autonomen, often squatters and punks who were influenced by libertarian versions of Italian Marxism as well as anarchism, took to wearing black during squat defences and demonstrations against nuclear energy and apartheid. Notably, the autonomen, as early as 1988, organized mass militant demonstrations against the IMF and World Bank as identifiable agents of global capitalism (See Katsiaficas, 1997). Given the circulation of anti-capitalist strategies and tactics, spurred even further by the growth of the internet, anarchists and punks in North America eventually picked up on the black bloc. In February 1991, during demonstrations against the Gulf War in Iraq, anarchists associated with the federation Love and Rage brought the black bloc to the streets of America. 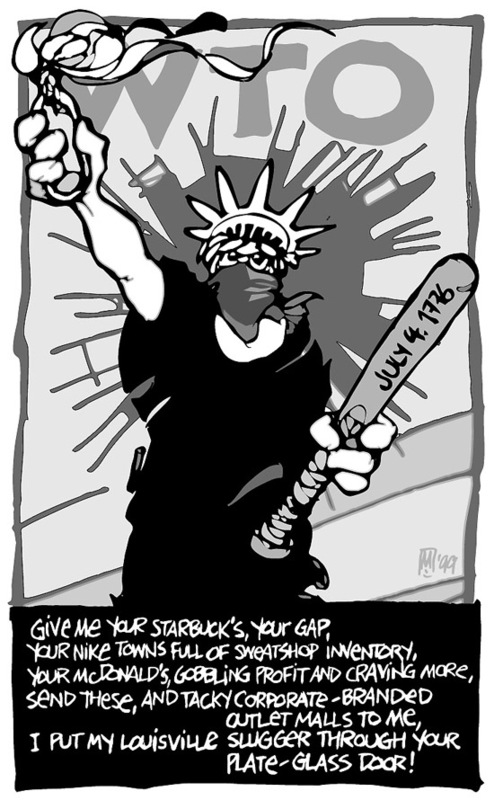 As anarchist commentator Liz Highleyman (2001) suggests, the black bloc itself emerged as an expression of frustration with the disempowering character of symbolic protests that in no way threatened state or capitalist authorities: “Coming out of the stultifying political climate of the Reagan and Bush pere years, many young activists had gotten sick of ‘protest as usual.’ Mostly in their teens through thirties, few black blockers remembered the glorified 1960s; they grew up on a diet of well-choreographed rallies, permitted marches, and planned mass arrests.” For many activists, protests that were too much civil and not enough disobedience had run their course. 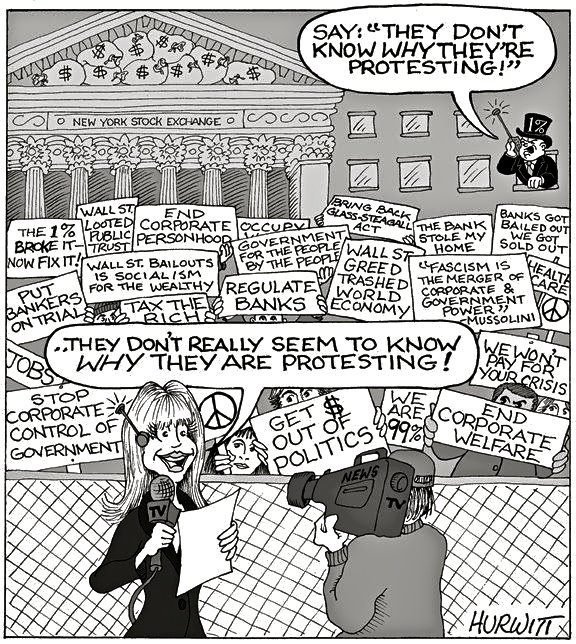 Organizing hundreds of people for a demonstration, only to have them stand around and hold placards and chant slogans, had come to be seen as an inefficient use of resources or worse a waste of time, given that such protests hardly captured even the media attention that might lend them a broader symbolic value (Highleyman, 2001). 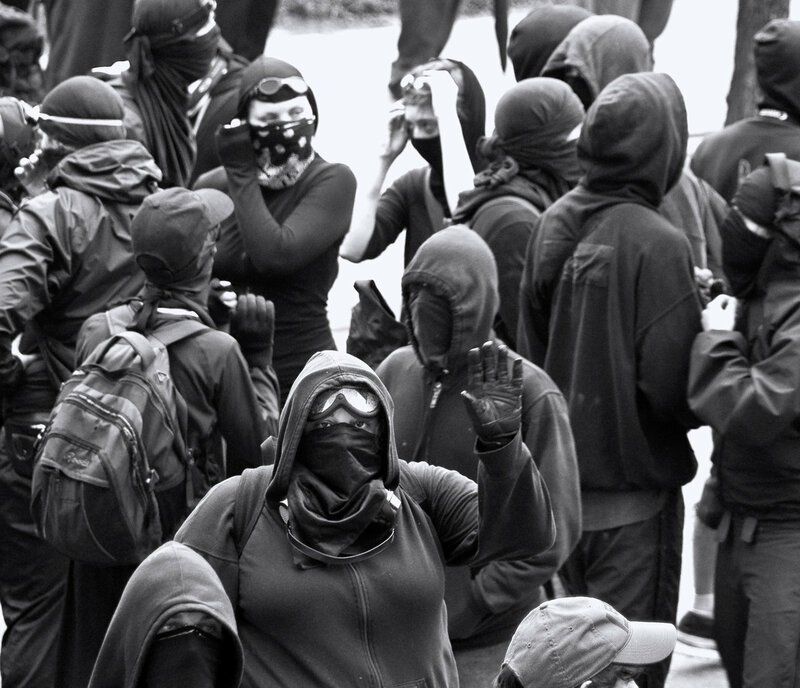 The black bloc takes its name from the black clothing worn by participants. In addition to the symbolic value of black as the colour of anarchy, the similar clothing guards against identification by police or security officers. If everyone in the bloc is dressed relatively alike it will be difficult for police to identify who has done specific acts. This protection extends beyond the immediate action since the uniform clothing also provides cover against film or video records that might be used to identify and arrest someone after an action. Masks and bandanas further conceal identities as well as provide some protection against tear gas or pepper spray. By the act of masking up in order to avoid recognition by police, the black bloc illustrates its disinterest in “open” dialogue or negotiation. It further states the refusal to elevate movement leaders or figureheads who might be singled out for special attention, either favorably by a media clamoring for interviews or negatively by police seeking to clamp down on perceived ringleaders. It has long been a tactic of police to target social movement leaders in an attempt to disrupt movement activities. Simultaneously the black bloc registers its view that police, rather than being neutral peacekeepers, are agents of repression/paid defenders of private property who, in the normal discharge of their duties, rather than as an exceptional circumstance, will be charged with identifying and apprehending activists in order to circumscribe or contain political actions within channels sanctioned by the state. As well as confrontations with police, the most distinguishing characteristic of the black bloc as image event is most likely its willingness to engage in dramatic street actions that may include destruction of corporate property. Black blocs have provided such a striking and memorable presence at demonstrations because they are also organized and prepared to confront institutions of capitalist power, especially banks, corporate offices, multinational chain-store outlets video surveillance cameras and gas stations. Consistent with an anarchist perspective, black blockers have no regard for institutions of capital and the state and reject the legitimacy both of private property claims and defence of private property by the police. Regardless of what some would call the ominous black outfits, it is clear that no one would worry much about the black bloc without this confrontational aspect of its practice. In addition to the more dramatic black bloc activities, participants are active as medics and communication people. In this way there is a space within the black bloc for people who do not feel that they can take part in more confrontational activities but still support the black bloc as an important presence in the streets. Within the bloc there are a variety of tasks that need to be done. As demonstrations have developed and participants have learned from their experiences, some black bloc activists have experimented with new ways to improve tactics and organization within the blocs. Some have elected tactical facilitators for specific actions to increase the speed of decision-making and to improve mobility, especially where there is limited knowledge of unfamiliar streets. In other cases specific affinity groups have taken on specialized tasks within the bloc, such as offense, self-defense, communications or medics (Highleyman, 2001). Beyond its tactical value, black blocs highlight Kevin Hetherington’s assertions regarding the significance of the spatial dimension of conflict. 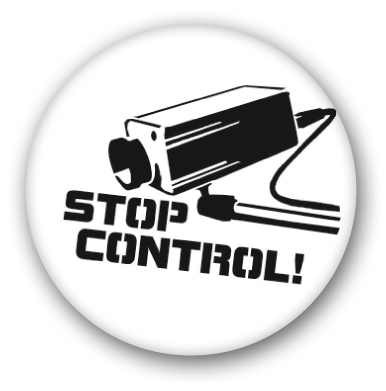 According to Hetherington (1992: 96) the “use of space is fundamentally a conflict between control through surveillance and the establishment of new lifestyles in the public view”. In the 1890s anarchists were publicly identifiable by the billowing black flags they carried at May Day marches, at mass demonstrations and during labor strikes. 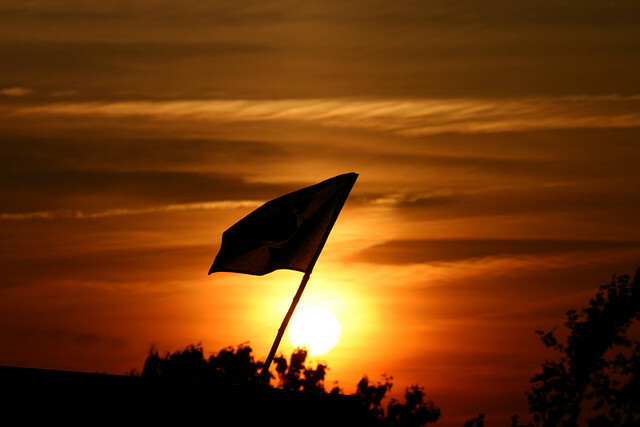 The black flag has long stood as the universal negation of all national flags that symbolize, for anarchists, the dividing and conquering of subordinate groups that finds its ultimate expression in the wars that primarily kill the working class, peasants and poor people (see Ehrlich, 1995: 31-32). Today, as one black bloc participant suggests: “The black bloc is our banner.” The black bloc is a vibrant contemporary manifestation of anarchist identity, a personification of the black flag. Anarchist webmaster Chuck Munson refers to the black bloc as “the anarchist equivalent of a gay pride march” (quoted in Highleyman, 2001). Both Barbara Epstein and David Graeber make a point of suggesting that for many contemporary activists anarchism is more a sensibility than a movement or philosophy with historical roots. For contemporary young radical activists, anarchism means a decentralized organizational structure, based on affinity groups that work together on an ad hoc basis, and decision-making by consensus. It also means egalitarianism; opposition to all hierarchies; suspicion of authority, especially that of the state; and commitment to living according to one’s values. Young radical activists, who regard themselves as anarchists, are likely to be hostile not only to corporations but to capitalism. Many envision a stateless society based on small, egalitarian communities. For some, however, the society of the future remains an open question. For them, anarchism is important mainly as an organizational structure and as a commitment to egalitarianism. It is a form of politics that revolves around the exposure of the truth rather than strategy. It is a politics decidedly in the moment (Epstein, 2001: 1). While I disagree with aspects of Epstein’s description of anarchism as sensibility, I would suggest that this view of anarchism is related to the focus on those anarchist activities related to black bloc actions at political protests. The black bloc, as a tactic, is by definition a politics of the moment, based on action-specific affinity groups, solidarity and self-defence. The black blocs form, dissolve and re-form as the situation requires, re-constituting themselves on a different basis for each political demonstration. 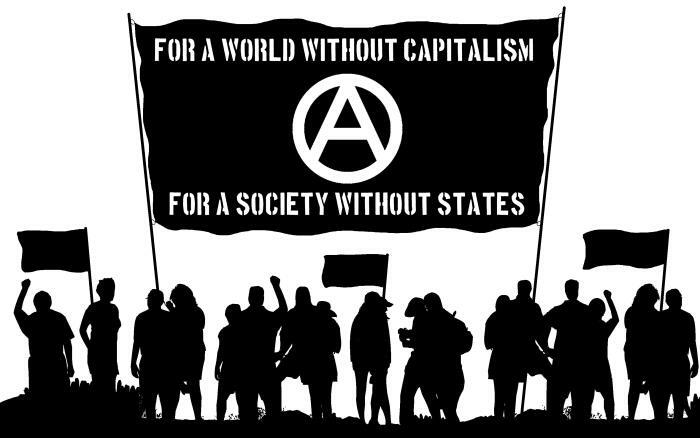 For many anarchists, one step in overcoming exploitation and building movements that might challenge capitalism is breaking the cultural and legal codes that uphold injustices and inequalities based on private control of collectively produced property. From this perspective, the black bloc is a contemporary expression of “propaganda of the deed”, a notion popular in the 19th century that exemplary acts against representatives of the state and capital might serve as pedagogical tools in the processes of delegitimizing bourgeois morality and encouraging the oppressed to shed such ingrained values as respect for property and the law. Thus the black bloc, and its attacks on corporate property, represents a dramatic, if symbolic, shattering of hegemonic corporate claims on ownership and property rights which are deeply ingrained but which anarchist hold to be illegitimate. The black bloc is a rushing wave of negation crashing against the material manifestations of the most central and vigorously defended beliefs of capitalism and liberal democracy. Significantly, black bloc participants are careful (as much as one can be in the heat of battle) to select targets that convey the anti-capitalist message most directly and forcefully. There is a well-considered method to their seeming madness; black blockers know whose property they are destroying, and why. Banks and oil companies often become targets, as do retail outlets that sell sweatshop merchandise and fast food restaurant chains that contribute to the global monoculture. In Seattle, black blockers used rocks, crowbars, newspaper boxes, and eggs filled with glass-etching solution to attack corporate storefronts such as Niketown and Starbucks, leaving nearby “mom and pop” businesses untouched. Most back blockers steer clear of damaging small shops, homes and cars (although some are less discriminating when it comes to luxury autos and SUVs) (Highleyman, 2001). In addition to its visual rejection of property rights, the black bloc offers a rejection of the role of protesters as petitioning subjects. The black bloc is also a vibrant manifestation of the refusal to accept one’s position as obedient subject or even of loyal opposition. Where government and corporate leaders seek protest permits or allow the right of assembly only within elite sanctioned and heavily circumscribed “protest pits,” the black bloc asserts its right to occupy public space and to seek direct access to ruling corporate and government bodies. Perhaps nowhere was the black bloc refusal to accept the statist or capitalist-sanctioned restrictions on popular assembly and participation more symbolically powerful than at the Free Trade Area of the Americas (FTAA) meetings in Quebec City in 2001. At the FTAA summit in Quebec City last summer, invisible lines that had previously been treated as if they didn’t exist (at least for white people) were converted overnight into fortifications against the movement of would-be global citizens, demanding the right to petition their rulers. The three-kilometre ‘wall’ constructed through the centre of Quebec City, to shield the heads of state junketing inside from any contact with the populace, became the perfect symbol for what neoliberalism actually means in human terms. The spectacle of the Black Bloc, armed with wire cutters and grappling hooks, joined by everyone from Steelworkers to Mohawk warriors to tear down the wall, became — for that very reason — one of the most powerful moments in the movement’s history (Graeber, 2002: 65). For many outside observers watching the events of alternative globalization or anti-capitalist mobilizations unfold on their television or computer screens, it has been the striking scenes of black-clad demonstrators putting bricks through corporate windows and battling with police that provided the compelling and indelible images from the streets. It was also those images that suggested a break with previous forms of civil disobedience and hinted at the emergence of a new and more militant movement against global capitalism. To a certain extent the anti-globalization movement was born, at least in the eyes of the general public, in the unexpected actions of the black-clad demonstrators who refused to play by the assumed rules of public protest in expressing their opposition to the WTO and its corporate backers. In the series of demonstrations that took place over the course of several days, the young, radical activists who engaged in civil disobedience were greatly outnumbered by trade unionists and members of mostly liberal environmental organizations. But it was the young radicals who blockaded the meetings of the WTO, fought the police, liberated the streets of Seattle, and whose militancy brought the attention of the media to a mobilization that would otherwise have gone unnoticed outside the left (Epstein, 2001: 9). And in a limited way this is significant. Every social movement requires a foundational image or event, something that marks it as recognizable and memorable for people outside of the movement. As well such images or events serve a social mythic role in the minds of movement activists, serving to provide a marker of solidarity, commonality and shared history. To a certain extent the black bloc has served for contemporary anarchists the mythic role ascribed to the general strike by Georges Sorel in his writings on social myths in working class movements. Sorel was primarily interested in the myths by which agents actively organize to undermine a political status quo. “An important aspect of those social movements concerned with social change, Sorel noted, is the creation of myths which help members to make sense out of the present, justify their efforts at change, and point to a new future” (Neustadter, 1989: 345). Any myth, for Sorel, consists of “a body of imprecise meanings couched in symbolic form” (Hughes, 1958: 96). Included within myths are symbolic elements introduced by what Sorel terms “expressive supports.” These expressive supports bridge the gaps in discourse and, laden with emotion, they provide part of the appeal of social movements. The black bloc’s pedagogical effort goes beyond bodies in the streets. In a popular series of anarchist posters produced with various images under the heading “Support Your Local Black Bloc” one of the most widely distributed posters included an image of a brick smashing a Niketown window. The caption, a take-off on a Nike slogan, read: “Life’s Short: Throw Hard.” This suggests the mythic character of the black bloc as its image becomes a widely circulated symbol of defiance, disobedience and transgression. The significance of this aspect of the black bloc within anarchist movements becomes readily apparent if one looks at the prevalence of black bloc imagery within major anarchist publications or on popular anarchist websites. The most contentious point of debate around the black bloc, and the anti-globalization movement more broadly, involves the question of violence. This has been a heated and ongoing debate since Seattle when the black bloc made literally its breakthrough appearance in mainstream consciousness by shattering the windows and otherwise destroying the property of corporations in the downtown area near the WTO meeting sites. Certainly, accusations of violence have been regularly leveled against the black bloc by the mainstream media. In addition to disputes over the legitimacy or necessity of property destruction, some have argued that the black bloc actions incite police violence or provoke greater police violence against protestors. In particular it is claimed that the black bloc spurs police violence against protestors who are not part of the black bloc. 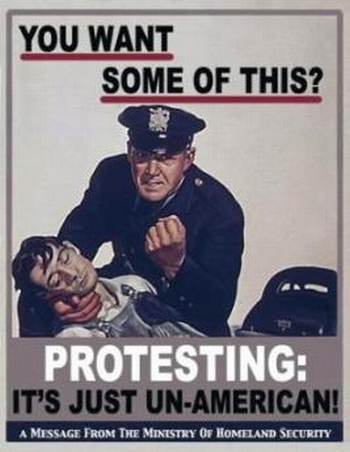 Such expressions are typically invoked when a simple, plain-English description of what took place (people throwing paint-bombs, breaking windows of empty storefronts, holding hands as they blockaded intersections, cops beating them with sticks) might give the impression that the only truly violent parties were the police. The US media is probably the biggest offender here — and this despite the fact that, after two years of increasingly militant direct action, it is still impossible to produce a single example of anyone to whom a US activist has caused physical injury. I would say that what really disturbs the powers-that-be is not the ‘violence’ of the movement but its relative lack of it; governments simply do not know how to deal with an overtly revolutionary movement that refuses to fall into familiar patterns of armed resistance (Graeber, 2002: 66). Chomsky (1989) argues that liberal democracies, which cannot rely on the iron fist of repression to control subordinate populations, must nurture systems of legitimacy in order to manufacture the consent and loyalty of the governed. Herman and Chomsky (1988) argue that the news media in the US is both part of the ruling power structure and reflects the ruling interests in the presentation of media messages. 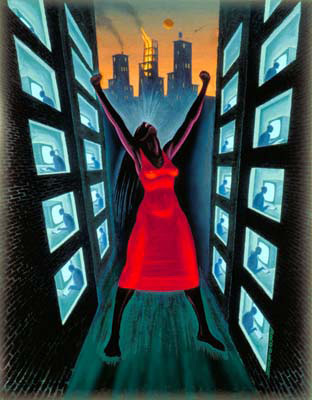 Support for status quo interests is not only, or even most significantly, the result of the conscious individual biases of journalists, but is part of the structures and processes of corporate news production, including professional conventions and ideologies, economic links, organizational needs and hegemonic worldviews (McLeod and Detenber, 1999: 4). While corporate media will occasionally criticize groups in power, McLeod and Detenber (1999) note that this is most likely in cases in which there is elite conflict. In contexts where there is little elite conflict, as is the case in free trade summits or responses to domestic movements against neoliberalism, media support for the status quo tends to be solid (McLeod and Detenber, 1999; Herman and Chomsky, 1988). Mainstream media support for the status quo in new coverage of social movements and demonstrations has been well established for some time now (Gitlin, 1981; Chomsky, 1989; McLeod and Detenber, 1999). Chan and Lee (1984) even suggest that the common assumptions that guide media coverage of political demonstrations constitutes a “protest paradigm.” McLeod and Detenber (1999: 5) identify a variety of characteristics of a protest paradigm in the mainstream media, including: “narrative structures; reliance on official sources and official definitions; the invocation of public opinion; and other techniques of delegitimization, marginalization and demonization.” Donohue, Tichenor and Olien (1995) argue that rather than playing the watchdog role often attributed to it, the mainstream media play a guard dog, defending the system against a range of threats. Social protest, particularly that which advocates radical change, may present a threat to the social system. The normative theory that underpins the watchdog media holds that the media should objectively explore the protestors’ social critique by launching a serious investigation of its merits with respect to all available facts. The guard dog media, on the other hand, take a hostile stance toward the threat posed by social protest. Because of their ties to the power structure, the guard dog media often cover protests from the perspective of those in power. 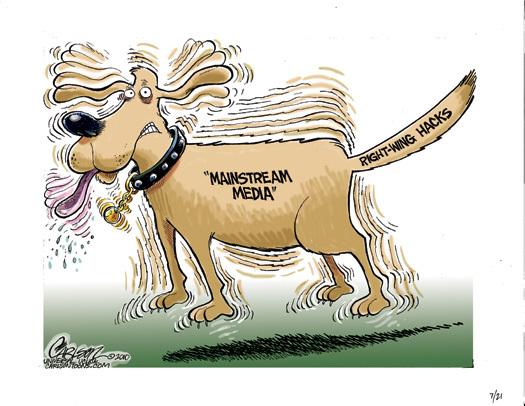 Guard dog media coverage highlights the deviance of the protestors, diminishing their contributions and effectiveness, insulating the power structure, and defusing the threat (McLeod and Detenber, 1999: 5). As McLeod and Hertog (1992: 260) note “protest coverage adopts ‘official’ definitions of the protest situation by focusing on questions of the ‘legality of actions’ as opposed to the ‘morality of issues.’ In the process, coverage legitimizes official authority and marginalizes radical protest groups.” Through close examinations of news content, McLeod and Detenber (1999: 3) are led to suggest that “news stories about protests tend to focus on the protestors’ appearances rather than their issues, emphasize their violent actions rather than their social criticism, pit them against police rather than their chosen targets, and downplay their effectiveness.” Such coverage works to re-inscribe hegemonic assumptions relating to acceptable forms of dissent, law and order and the status of opposition groups, among other issues. It should be remembered that the first “Red scare” in the US was actually directed at anarchists during the last decades of the nineteenth and first decades of the twentieth centuries. 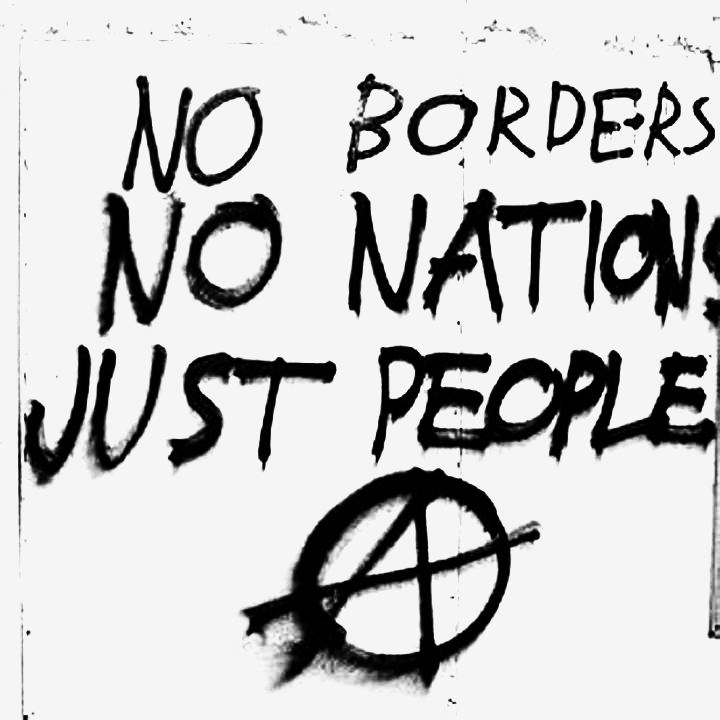 The 1880s began a period of intense, and highly charged, public discussion of anarchism culminating in the passage in 1903 of an immigration law that sought to prohibit anarchists from entering the US (Hong, 1992). As Hong (1992:111) suggests: “The anarchist was the constructed devil of the American civic religion of the late nineteenth century. It was made the bogeyman to guard the borders of the political allegiances, loyalties, and obedience of American citizens.” The anarchist Red scare introduced a durable theme in American political life, not only as a justification for hegemonic ideologies and the construction of social cohesion, but also to delineate and to reinforce the acceptable features of American political culture (Hong, 1992: 110). The anarchist trope has been especially prominent during periods of great social upheaval and transformation such as the present period of capitalist globalization, characterized by the shift from Fordism to post-Fordism, the welfare state to neoliberalism. Similarly, the era of the first Red scare was one of intense social conflict and dislocation as traditional social relations and values were undermined or dismantled. Under such shifting circumstances, forces vying for hegemony are faced with the task of developing institutional and ideological strategies for forging some social consensus and cohesiveness, typically in the face of grassroots movements seeking to establish their own forms of solidarity and social cohesion on their own terms. “Lurking behind the attack on one kind of revolution of social relations was a different revolution: the appropriation and concentration of power in corporate capitalism and in the strong nation-state. A common interest with the ideology of the latter revolution was cultivated in inverse proportion to the anxiety created about the challenger” (Hong, 1992: 111). As described by Hong (1992: 111), during the first Red scare the image of the anarchist was deployed in a manner that prefigures the official response to anti-globalization movements today: “The symbolic anarchist enemy came to personify the challenge of anti-capitalist ideas and values. It was constructed to evoke associations that fostered dependency on authority, freezing political perceptions and conceptions within an acceptable framework. By putting the ‘anarchist beast’ beyond the pale, it kept citizens within the fold.” Despite the claims of some that the period of globalization has witnessed a decline in the nation state, it is more accurate to suggest that authorities within the present period, like the period of the first Red scare, have responded to social upheaval through the promotion of a strengthened nation-state and of values that support it. As Hong (1992: 110) suggests the Red scare against anarchists, which marks the beginning of an American political tradition, is significant “because it produced an evocative condensation symbol that has retrained its power into contemporary use. An excess of democracy can still be discredited as the threat of impending anarchy.” The anarchist beast remains, even a century after it was supposedly vanquished, a key ideological symbol in legitimizing state or corporate discourses and practices, especially in the face of growing opposition movements against capitalist globalization. As black bloc participants are quick to point out, such characterizations of activists and demonstrations will be put forward by mainstream media regardless of the presence or size of any black bloc. In this they have clearly learned a lesson shared by media historians: “The intensity of Red scares far exceeds the actual threat the scapegoat groups represent. This makes sense, insofar as the primary object of these campaigns is not to defeat the weak and resourceless enemy but to win favor for elements within the governing elite and to accomplish the ideological rearmament of a population” (Hong, 1992: 127, n. 4). Anarchists, as well as any media analysts, are also cognizant of the fact that corporate media are not forums for explaining complex issues. They realize that in the absence of controversial acts and open conflict the media would likely give little attention to the protests. Indeed some would claim that the most significant factor contributing to the attention given to issues of global trade recently has been the emergence of the black bloc. By comparison activists point out the lack of attention given to protests against free trade agreements in the 1980s and early 1990s and the relative lack of attention given to the massive anti-war demonstrations against the war in Iraq, which were free of black bloc activities. Given the tendency of mainstream media depictions of protesters to marginalize or delegitimize activist events during political demonstrations, there are clearly limitations to the effectiveness of the black bloc tactic as a means of “propaganda of the deed.” While anarchists have correctly criticized symbolic protests for their reliance upon mainstream media to get the message out, there has been less willingness to recognize that the situation is even more precarious for more confrontational actions that, in fact, carry more complex messages such as the refusal to recognize property rights. In light of the mainstream media’s well-documented preference for what McLeod and Detenber (1999: 6) describe as “news stories that focus on conflicts with the police, obfuscating the issues raised by the protestors…and characterizing the protesters as ‘deviants’ and ‘criminals,'” it is questionable whether or not the black bloc’s messages could have any chance of getting out in anything resembling their intended form. The prospects become even less likely when one considers that “the more a protest group challenges the status quo, the more closely the media will adhere to the characteristics of the protest paradigm. In short, news coverage will marginalize challenging groups, especially those that are viewed as radical in their beliefs and strategies” (McLeod and Detenber, 1999: 6). As I have pointed out elsewhere (see Shantz, 2003), this is particularly relevant given that prior to September 11, no groups were viewed as more radical than the black bloc anarchists. Having said this, however, it must be remembered that the black bloc tactic, as propaganda, is not specifically directed at general audiences watching the events on television. The above discussion serves as confirmation of the black bloc thesis that the mainstream media cannot be looked to as reliable carriers of oppositional messages and thus protesters should not waste time on symbolic actions that rely on the mass media to “get the message out.” In actuality the black bloc tactic is more clearly presented as a lesson for other activists or observers who are already politicized to some extent. When the black bloc speaks its key messages of self-defence against police aggression, the limitations of liberal democracy and the illegitimacy of corporate property it is speaking primarily to fellow protesters to convince them of the necessity and the possibility of struggles that disrupt, rather than negotiate with, power holders. Against messages that ask for access to government structures or seek to influence the state or capital, the black bloc visibly poses an alternative that seeks to make it impossible for such authorities to act. And, it must be noted that anarchists do not rely on black bloc actions on the street to make this point. In order to explain the ideas behind the image anarchists make use of a variety of their own “do-it-yourself media,” especially websites, radio and e-mail lists to ensure that propaganda is not left to the deed alone. More properly stated the supposed debate over violence is more a debate over the place of property destruction within the movement since few, if any, groups in North America advocate, defend or engage in acts of violence against people. In fact, even the most militant contemporary anti-capitalist organizations in North America have been extremely careful to avoid any actions that would cause physical harm to humans. As Graeber (2002) notes, many of these groups even work scrupulously to avoid harm to animals. For black bloc participants, on the issue of property destruction there is really no debate at all, since, from an anarchist perspective, corporate property is only a visual marker of exploitation, of labor stolen from working people. In the famous words of the nineteenth century anarchist Pierre-Joseph Proudhon: “Property is theft.” And in saying this anarchists are careful to make the distinction between property as means of exploitation and personal possessions. For anarchists, property damage or vandalism cannot be compared with violence regularly directed against people by states, corporations or police in the defense of property. As one anarchist describes the conflation of vandalism with violence: “The media treats property destruction as being the same thing as destruction of people. This is pretty much in keeping with the values of the people who run society — that their property is worth more than everyone else’s life” (James Hutchings quoted in Highleyman, 2001). Furthermore to suggest that destruction of property has no place in nonviolent movements, as some critics of black blocs have, is to throw out the histories of the civil rights and anti-Vietnam War movements, as well as much of environmentalism and feminism. The larger danger for anarchists is when other activists start to believe the hype and allow themselves to become caught up in false debates carried out on terms established by corporate media and government spokespeople. To a certain extent the black bloc leaves itself open to these sorts of misrepresentation. In movements of pacifists, hordes of masked guerrilla lookalikes can be a bit disconcerting. Some organizers of the Seattle demonstrations were surprised by the actions of the black bloc and have tried to distance themselves from those actions. In almost every anti-globalization demonstration since, there have been members of more liberal protest groups that have tried to distance themselves from the black bloc. More than that, there have been numerous instances, of protestors attempting to restrain black bloc members and even some cases of activists turning them over to police. The significance of these actions is that they suggested an early fissure within the anti-globalization movement; a fissure marked as a black dividing line within the anti-globalization protests. In fact, since 9/11 in the US there have been some opponents of anti-globalization forces who have used the image of the black bloc to suggest some sort of “internal” terrorist organization. More strikingly, within the movement itself some liberal activists have argued that following 9/11 attacks on corporate targets are inexcusable. In response to increasingly sharp criticism of the black bloc and property destruction, especially from liberal participants in anti-globalization protests, black bloc supporters have argued that the movement’s strength derives largely from the commitment to a “diversity of tactics.” Autonomous actions carried out by affinity groups allow for the broadest range of forces to be brought to bear against the organizations and institutions of capitalist globalization. The effort to destroy existing paradigms is usually quite self-conscious. Where once it seemed that the only alternatives to marching along with signs were either Gandhian non-violent civil disobedience or outright insurrection, groups like the Direct Action Network, Reclaim the Streets, Black Blocs or Tute Bianche have all, in their own ways, been trying to map out a completely new territory in between. They’re attempting to invent what many call a ‘new language’ of civil disobedience, combining elements of street theatre, festival and what can only be called non-violent warfare — non-violent in the sense adopted by, say, Black Bloc anarchists, in that it eschews any direct physical harm to human beings (Graeber, 2002: 66). In another interesting use of colour-coded imagery, organizers of the Quebec City actions attempted to establish different zones in the downtown so participants could choose where to go based on anticipated levels of engagement with police. Green Zones were areas set up for festive street party activities and anticipated little involvement with police while Yellow Zones were areas in which it was expected a larger police presence would be met by low intensity forms of civil disobedience. Red Zones were areas reserved for the black bloc and other direct action activists. Many black bloc participants suggested at the outset that this arrangement was dangerously naive since demonstrators, especially in Green and Yellow Zones would have a false sense of security while police would pay no regard to such activist designations. The events of Quebec City in which a massive police presence showered the entire downtown with tear gas while making repeated runs through the crowd with water cannons once again bore out the realist assessment of the black bloc. At the same time the events in Quebec City showed the potent force of the black bloc as a symbol of resistance and determination in the face of massive and sustained repression. In an attempt to shelter heads of state and corporate leaders from any sign of protest, security officials built a fence around the entire section of the downtown in which the conference hotels and meeting centres were located. For many, even casual observers, this presented a striking symbol for the exclusionary governance practices accompanying neoliberalism. On the first day of the actions, the black bloc, the “white overalls,” and other militant activists attacked and breached the fence. Police let loose with tear gas, water cannons, dogs, and plastic bullets, which only had the effect of enraging the crowd. By the end of the second day, protesters of all persuasions — along with many local residents — were standing their ground, cheering the bloc on, and lobbing their own tear gas canisters and rocks at the cops (Highleyman, 2001). Significantly, rank-and-file unionists, who had been led, on the second day, to an open field away from the fence by leadership hoping to avoid any confrontation, disobeyed union marshals and made their way to the red zones to stand with the black bloc in battling police and asserting the right to be in the streets. This was an extremely important development that both refuted the claims of moderates that the black bloc tactic would only alienate working people and showed that broader sections of the anti-globalization movement were becoming convinced of the rightness of more militant actions. I thought high levels of confrontation would lose us popular support, but we had the strongest support ever from the local people. 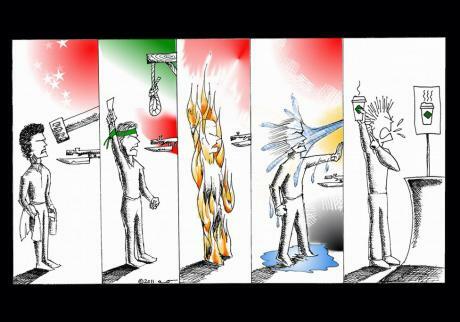 I thought people new to direct action would be terrified by the level of conflict we experienced. But by the second day, more people were ready to go to the wall. By the third day, they were demanding better gas masks (Starhawk, 2001). Rather than scaring away members of the base movements, community groups have turned to black bloc techniques, if not the black clothing, for local actions. As one example, the Ontario Coalition Against Poverty (OCAP) a grassroots anti-poverty organization in Ontario, Canada has effectively used co-ordinated self-defense to protect members from police attacks during anti-poverty demonstrations. These techniques were put to good use on June 15th 2000, when OCAP members and allies held off a massive attack by police, including waves of mounted officers, for an hour during the police riot at the seat of Ontario’s provincial government. Elsewhere groups organizing locally around anti-racism or anti-fascism have also adopted black bloc tactics in defending neighbourhoods against organized racists. A swarm of mosquitoes is good for harassment, for disrupting the smooth operation of power and thus making it visible. But there are probably limits to the numbers of people willing to take on the role of the mosquito. A movement capable of transforming structures of power will have to involve alliances, many of which will probably require more stable and lasting forms of organization than now exist within the anti-globalization movement (2001: 13). As Epstein (2001: 2) notes, “telling truth to power is or should be part of radical politics but it is not a substitute for strategy and planning.” For many anarchists the black bloc strategy was fine for a small movement focused on direct action protest politics, but as anarchist movements have grown and developed something of a broader appeal beyond anarchist circles new strategies are necessary. Anarchists who are critical of the black bloc argue that the focus now must be on preparing for longer term struggles by developing roots in community and labor movements new strategies. It is time to drop the masks and come out and walk with the workers, in the words of one anarchist critic. The black bloc has made the most sense in the context of mass demonstrations in which direct action was certain to be met by a large and often violent police presence. Under circumstances in which simply being out on the street could lead to arrest, detention, trial and possible convictions the anonymity provided by the black bloc offered some protection — for a time. Over time the black bloc has become something of a self-fulfilling prophecy as police shifted their tactics to zero in on the black bloc, targeting its participants for often-severe violence usually before the demonstration even started. Black bloc participants are aware of the numerous challenges faced in developing effective movements against the state and capital. Part of meeting this challenge is regularly reviewing and revising strategies and tactics. Creativity and unpredictability, hallmarks of the black bloc itself, give the movement strength in the face of a much stronger opponent. 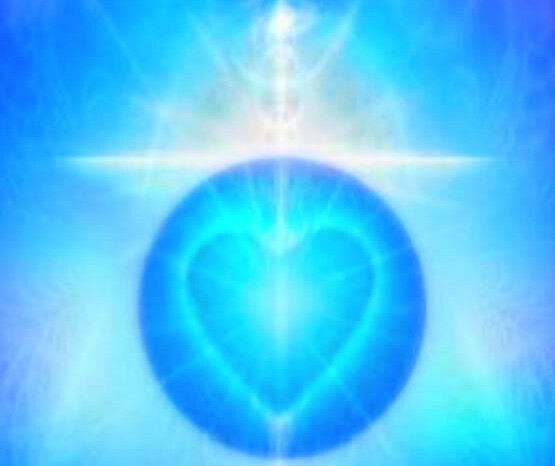 To maintain this strength requires developing new approaches. Many anarchists are beginning to focus on other types of efforts, such as rent strikes or alternative unions, that in the long run may prove to be more militant and effective than the black bloc. As Highleyman (2001) suggests: “They recognize that to be effective, they must rely on the element of surprise. Breaking windows and throwing rocks at cops no longer cut it, they fear, and the bloc has become a culture or an identity rather than a tactic.” Because the black bloc has had such a powerfully symbolic place in the emergence of anarchist politics within anti-globalization struggles, and because of its enduring mythic value, there is a danger that the bloc will cease to be viewed and evaluated primarily as one tactic among many. Instead it may be treated as a fetish object, a key part of the activist imaginary. The black bloc succeeds when it takes the cops by surprise. If the black bloc does nothing but property destruction or cop-confrontation, then the police will develop a strategy to deal with it. If we fight as army versus army, then we will lose. But if we fight like a chaotic ocean always lapping against an immovable rock, then we will win, just as the ocean always wins (Robin Banks quoted in Highleyman, 2001). Most anarchists recognize that other actions, especially workplace strikes and economic disruptions, are more effective and have greater long-term potential in terms of community mobilization than do black blocs. If one looks at the most durable and successful examples of community-based anarchist organizing since 1999, such as the efforts of the North Eastern Federation of Anarchist-Communists (NEFAC) and its successors, one finds many black bloc participants who have turned from summit protests as a major strategy towards less dramatic day-to-day efforts in workplace, anti-poverty and immigration struggles (see Shantz, 2005). At the same time there remains widespread agreement that in the context of political protests, where actions such as strikes are absent, property damage will impact corporations more than the avoidance of property damage will. The global power of private organizations such as multinational corporations and institutions such as the World Bank and International Monetary Fund, as well as the secret negotiations over trade deals such as NAFTA, reveal a sharp discrepancy between the rhetoric of democracy and the non-democratic policies and practices of governance bodies both globally and nationally. Anarchists can point to the global demonstrations against the invasion of Iraq, which brought millions of people into the streets around the world, and their utter dismissal by the governments of George W. Bush and Tony Blair as powerful examples of the futility of protest politics that seek to influence politicians through shaming rituals or appeals to conscience. For black bloc anarchists, there are no terms for debate, compromise or negotiation with such undemocratic and self-interested organizations. “However you choose to trace their origins, these new tactics are perfectly in accord with the general anarchistic inspiration of the movement, which is less about seizing state power than about exposing, delegitimizing and dismantling mechanisms of rule while winning ever-larger spaces of autonomy from it” (Graeber, 2002: 68). One aspect of that autonomy, forcefully displayed in black bloc actions, is the determination to express one’s needs, desires and commitments in the face of overwhelming power rather than to seek negotiation or compromise with that power. This remains a lengthy and difficult process. This is very much a work in progress, and creating a culture of democracy among people who have little experience of such things is necessarily a painful and uneven business, full of all sorts of stumblings and false starts, but — as almost any police chief who has faced us on the streets can attest — direct democracy of this sort can be astoundingly effective. And it is difficult to find anyone who has fully participated in such an action whose sense of human possibilities has not been profoundly transformed as a result (Graeber, 2002: 72). Unlike traditional social movements that organize and mobilize to air grievances or appeal to the conscience of rulers, the black bloc is not looking for a seat at the table or an access point from which state or corporate leaders might be lobbied. Instead, the black bloc asserts that, faced with rulers who have no conscience in institutions that are largely closed to the public, subordinates must affirm their own identities and values and prepare to defend them. This is a fundamental shift in how social movements have been understood for the past forty or so years. 1. Originally the title of Alexander Berkman’s newspaper of the nineteen-teens it has been adopted by contemporary anarchists in Minnesota for their own paper. 2. This was the code name assumed by the assassin and terrorist Sergei Nechaev, a colleague of Bakunin’s and author of the notorious Catechism of a Revolutionary. Nechaev was the source for Dostoevsky’s character Peter Verkhovensky in The Possessed. 3. This characterization comes famously from Lenin (1965), ‘Left-Wing’ Communism, An Infantile Disorder. 4. See Plekhanov’s (1912) confused polemic in Anarchism and Socialism.